Constantin Brancusi, primarily a sculptor, is known for his extremely abstract, exquisitely finished artworks. It was once said, as a result the first exhibition that he showed his sculptures, that a critic called his pieces “disturbing” and caused many viewers to rethink their attitudes towards a certain branch of art. In a way, this is a huge compliment because what the critic meant is that Brancusi’s pieces were so different than any others, he made people realize that art is more than what they thought. The exhibition at the Museum of Modern Art (MoMA) in New York City strives to form a portrait of the artist through 11 sculptural pieces, drawings and photographs, and documents from the museum’s archives about Brancusi and his art. This exhibition will be on show until February 18th, 2019. Materialistically, Brancusi began working with clay, traditional for sculptures of his time. However, after a while, he grew tired of clay and began carving sculptures from stone. At a young age he learned to carve and became a skilled woodworker, thereby preparing him for his path as a sculptor. It was not until 1914 that he began using wood in his art, along with stone and casted bronze from clay. While casting bronze allowed for easy editions of pieces, Brancusi felt that each piece is unique and never made two exactly the same. He would subtly alter the dimensions or surface quality of a piece so that is varied from the “duplicate.” Regardless of the medium, each piece of Brancusi’s has a distinct feel of human touch, clearly demonstrating the connection that Brancusi had with his pieces. Brancusi used abstraction as a way to evoke the feelings of the subject, rather that represent them. For example, Fish (1930) is a magnificent blue-grey marble carving that is the last of seven fish that Brancusi made. This one, the largest he made, brings up feelings of aquatic movement, how swimming in the depths of the ocean might be. While the work once spun on its pedestal, it no longer is able to. Yet, that does not interfere with the perceptual transformations that occur when the viewer walks around it. From one angle it is a broad stretch of marble, and from another it is just a sliver of color. Animals, specifically birds, were one of the main subject matters that Brancusi focused on in his works. Portraits of women and children was the other. In both contexts, Brancusi strayed from the conventional and used abstraction. Bases for his sculptures became a part of the sculpture. The pedestals that he created himself for his pieces, either from raw materials specifically for a piece, or from existing sculptures. An example of the latter is the piece, Maiastra (1910-12). In the center of this pedestal, there is a sculpture called Double Caryatid that depicts two figures. (A caryatid is an architectural support that is often carved in the form of a woman). The pedestals also helped him to present the sculptures in a way that spoke to the subject. For instance, the editions Bird in Space stand high above the viewers’ heads as if they were about to take flight and soar off into the distance. 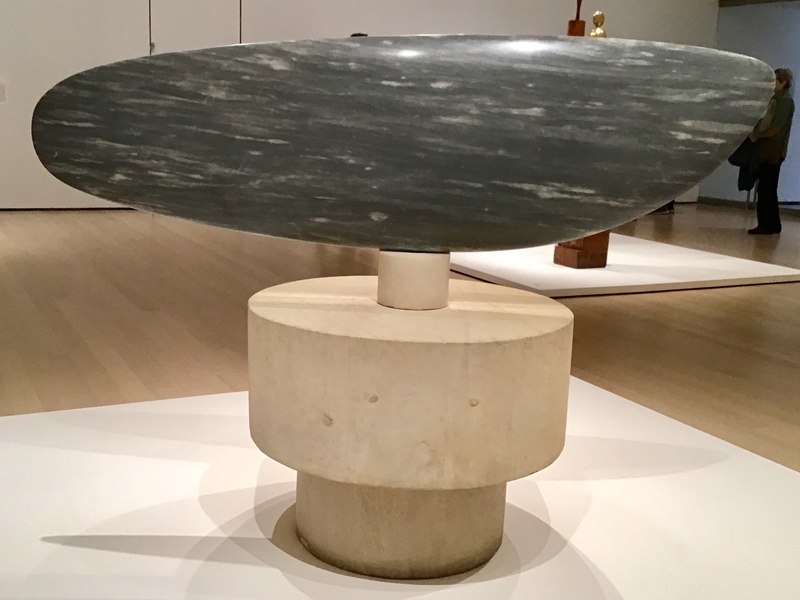 By including the base as a part of the art, Brancusi is blurring the relationship art has withe the world by implying that the base of art does not separate art from the rest of the world. Art exists and should not be differentiated from its surroundings because it is a part of the surroundings. The way that the curator of the MoMA’s exhibition arranged the artworks in the gallery space spoke to Brancusi’s feeling about art relating to its surroundings. The room felt natural, spacious, and interactive in the sense that the amount of space between sculptures was enough to enable the viewer to comfortably walk around the piece to get the full view. There was no overcrowding of viewers and art, it was an organic forest of Brancusi sculptures.